Strain and Counterstrain is a gentle soft tissue manipulation technique developed by Dr. Lawrence Jones D.O. over a 40 year period. This revolutionary technique, which is effective in treating pain, limitations in strength and range of motion, allows a therapist to painlessly “release” muscle and connective tissue spasm from all areas and systems of the human body. 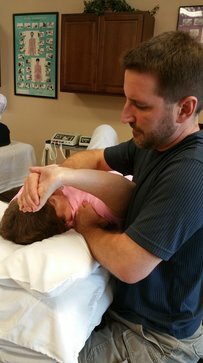 Further techniques have been pioneered, developed, and taught by Dr. Brian Tuckey PT, OCS, JSCCI of Tuckey and Associates and are sometimes known as fascial strain counterstain techniques. Because Strain and Counterstrain yields lasting results and has no side effects it has numerous applications in the rehabilitative setting and can be used to treat many body systems. To jump to the specific body systems you are interested about, click on their name below. To learn more about Strain/Counterstrain (SCS) in general, scroll down. The Jones Institute was established in 1988 by Dr. Lawrence Jones, D.O., F.A.A.O. and Randall Kusunose, P.T., O.C.S. The Jones Institute offers post-graduate SCS seminars for healthcare professionals throughout the United States. Originally called “positional release technique” was developed in 1955 by an osteopathic physician named Lawrence Jones. Strain and Counterstrain is a manual therapy technique, meaning the clinician only uses his hands, to treat muscle and joint pain and dysfunction. In observing a skilled Strain and Counterstrain practitioner you will immediately be impressed with how gentle and non-traumatic this technique is for treating the painful patient. A clinician is quickly able to assess the entire body for areas of pain and dysfunction. Strain and Counterstrain uses passive body positioning of muscles in spasm and dysfunctional joints toward positions of comfort or tissue ease that compresses or shortens the offending structures. The purpose of movement toward shortening is to relax aberrant reflexes that produce the muscle spasm forcing immediate reduction of tone to normal levels. This allows the joints influenced by the now relaxed muscle to function optimally increasing its range of motion and easing muscle pain. Strain and Counterstrain is an effective but extremely gentle technique because its action for treatment moves the patient’s body away from the painful, restrictive directions of motion. Who can benefit from Strain and Counterstrain? It can be used for the very acute traumas (i.e., sports injuries, motor vehicle accidents, ankle sprains, post-surgical, etc.) to the more chronic (i.e., osteoarthritis, fibromyalgia, TMJ pain, headaches, etc.). Its value with the acute patient is unmatched because it is so gentle and non-traumatic. The clinician is guided by what feels good to the patient and often dramatic changes are made in decreased pain, muscle guarding, and swelling. These changes facilitate the patient’s healing processes for a faster and complete recovery. The gentleness of strain and counterstrain makes it safe and effective for treating fragile patients (i.e., infants with torticollis, elderly patients with osteoporosis, stress fractures, pregnancy or pelvic pain patients, post operative pain etc.) and the pain associated with excessive joint motion or hyper-mobility. Strain and Counterstrain is valuable for the chronic pain patient because it will treat out a longstanding neuromuscular problem reducing the tone of a muscle in spasm. By diminishing the spasm, muscle pain is abated and joint function is normalized. Links to strain and counterstrain articles.